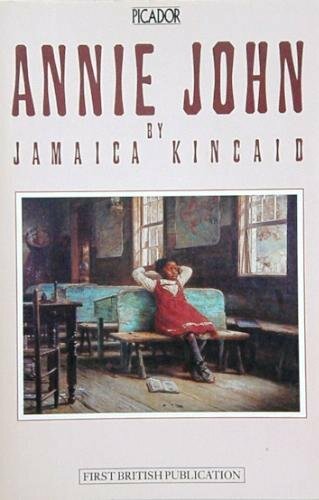 Caribbean literature is something that I haven’t read very much of, but the first two Jamaica Kincaid novels I read were Annie John and Lucy and that was a little over two years ago. I thoroughly enjoyed them. So to continue my discovery of Kincaid I picked up A Small Place and devoured it in a few hours. The first few pages surprised me because Kincaid immediately implements the reader in the story. She is speaking directly to us. Many people will feel uncomfortable and resent her accusations, but deep down inside we all know they are true. 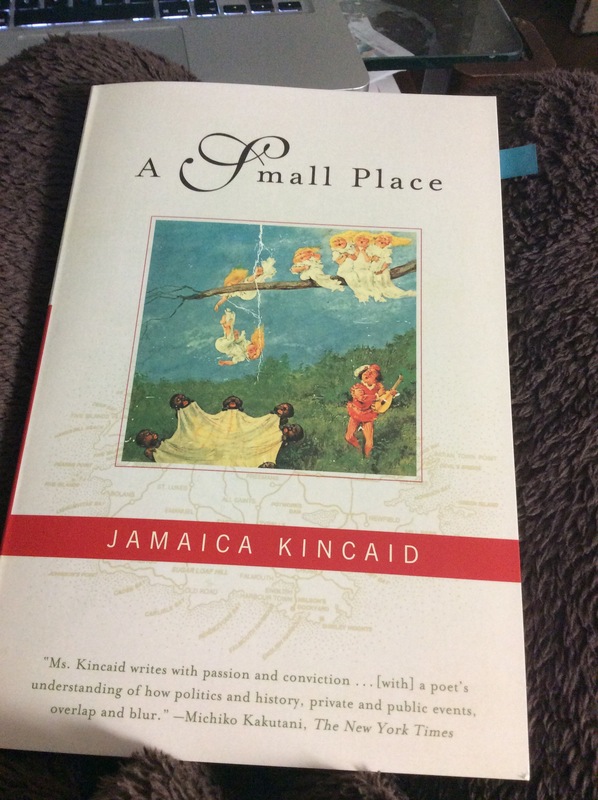 Within this tiny 81 page book, Kincaid explains the destruction and profiteering of her home, Antigua. The story starts with the ugliness of tourism. This is what will make the reader uncomfortable as we can see ourselves fit into the types of descriptions made about tourists. The beauty of Antigua, its beaches that aren’t all free to its citizens, the beautiful landscapes, marred by imposing 5 star hotels, are almost stage sets made so that tourism can progress. The exotic is what doesn’t allow tourists to see things as they are for Antiguans. Kincaid laments on the lack of decent education in Antigua and the refusal of all past government officials to rebuild the island’s library, which has been virtually out of commission since colonial times. There hangs on the building a sign which says, “THIS BUILDING WAS DAMAGED IN THE EARTHQUAKE OF 1974. REPAIRS ARE PENDING.” When this book was published in 1988, the renovation had been pending already for ten years. That library is a definite symbol of the status of the Antiguans and the island as a whole. They are nothing more than damaged remnants of colonial rule. Kincaid doesn’t believe that young Antiguans are as well-educated as in her day. She was educated under British rule with the classics (read Annie John for that understanding). She realizes that the one thing the youth have in common with her generation is their capacity to admire the people who enslaved them. i.e. The British in her time and the Americans for the young Antiguans. Jamaica Kincaid was born in St. John’s, Antigua in 1949, She now lives in Vermont and teaches at a university in California. She is a writer, a gardener, and gardening writer. Her work is qualified as autobiographical and is criticized as being angry. Her books contain the following themes: post colonialism, neocolonialism, British/American imperialism, adolescence, mother-daughter relationships, racism, sexuality, class, and power. She has received many literary awards including being shortlisted for the PEN/Faulkner Award for Fiction for At the Bottom of the River in 1984 and The Autobiography of My Mother in 1997. As for me I hope to pick up the controversial See Now Then at some point this year. What do you think of Ms. Kincaid’s work? Have you read any of Ms. Kincaid’s work? If so what was your favorite? Yesterday I spent a pleasurable day reading Annie John by Jamaica Kincaid. Wonderful quick read, only about 148 pages and beautifully written! This book was recommended to me by a friend who told me to start with Annie John but that she prefered other titles by Kincaid instead. I also have Lucy on the TBR shelf so it will most likely be one of my 50 books of 2012. Annie John is a coming of age story which takes place in Antigua. Annie is young when the story begins and it continues on through her adolescence. Annie and her mother have a close loving relationship that slowly but surely develops into hate and despise. What I loved about this novel were all the little stories that are recounted by Annie that illustrate what life is like on an island at this time. Colonialism and strict education are the background of this story. You practically feel the breeze and sun on your face. I can’t say any more than that because I’ll give everything away. 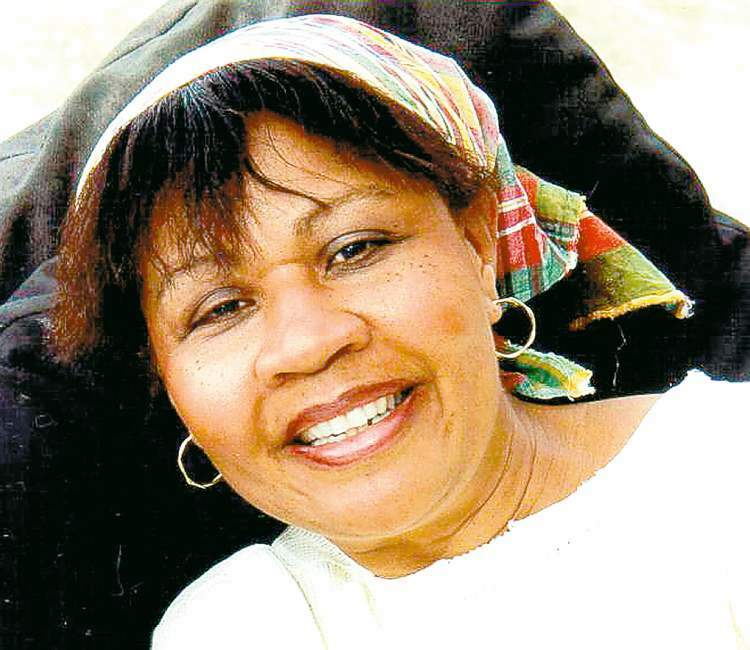 Elaine Potter Richardson is the real name of Jamaica Kincaid. She was born in 1949 and grew up on the island of Antigua. In 1973, her family’s disapproval of her writing led to her name change. Kincaid writes on recurring themes in her books such as Caribbean tradition, mother-daughter relationships, shaping female identity in a male dominant society, and the lack of Antiguans to fully achieve independence because of colonialism to note a few. If you’re interested here is a list of some other interesting novels by Kincaid At the Bottom of the River, My Brother, The Autobiography of My Mother, A Small Place….